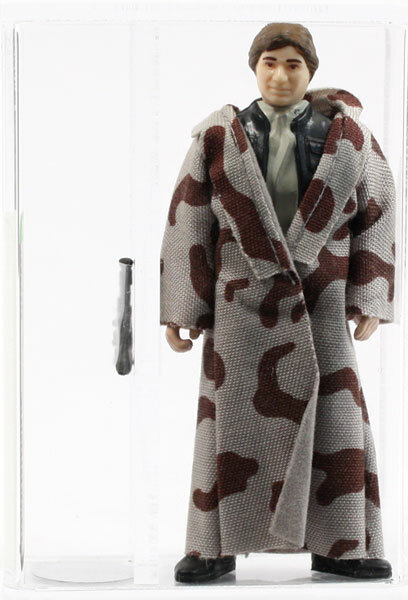 I bought this, camo Lapel variant, Han trench coat on ebay recently. But I'm not altogether sure of its authenticity. The lapels look very narrow, compared to other ones I've seen. The fit isn't very good and the weave of the fabric looks slightly different, compared to the regular, non camo, lapel coat. It almost looks like someone has removed the original lapels, then cut down one of the panels to make the new, camo lapels. Although if your going to remove the lapels, why not just flip them over then stitch them back on? Also the stitching along the lapels matches the rest of the cape perfectly, although the stitching seems to run down the middle of the lapel rather than along the edge. Is there a wider and narrower lapel variant, or is it just a quite badly made factory error cape? I didn't pay very much for it as its not in the best condition, but I am interested to know your thoughts on it. I don't know how it got here Chris, but I'll move Nicks WTB thread for you. With regards to your Han Trench coat, my examples have the stitching nearer the edge, but I did find this graded one (not that being graded counts for much) which looks similar to yours. That graded one does look very similar to mine, but the lapels are still wider, reaching out over his shoulders. Where as mine are quite narrow, but it could just be due to the misaligned stitching, pulling them in a bit. So it would appear to be genuine, which is good cheers. Subject: Re: Han Trench Coat help?